Have you ever had one of those dinner’s where you knew how unhealthy it was but you just didn’t care? Living in the country that’s pretty much every meal in a traditional home. One of the more popular country meals aside from the obvious is Chicken Fried Steak. 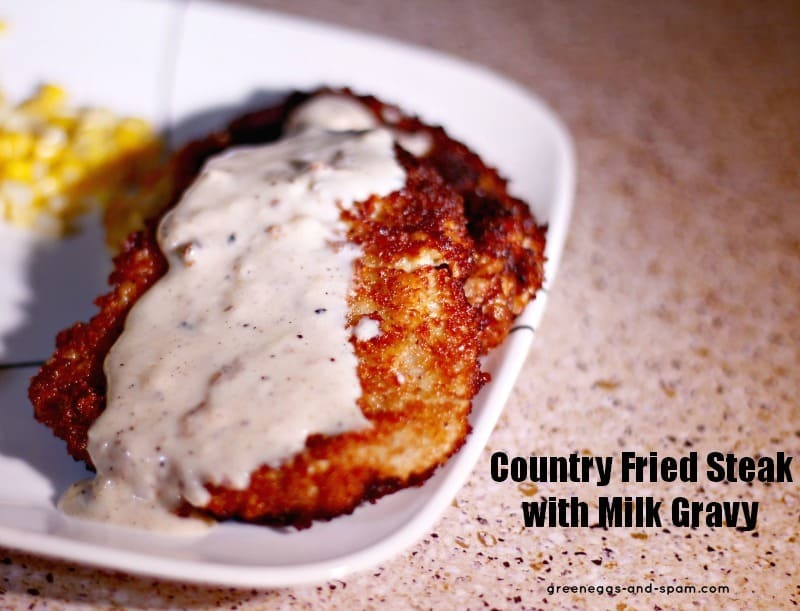 On top of that Chicken Fried Steak is a layer of thick, creamy white gravy we like to call milk gravy. 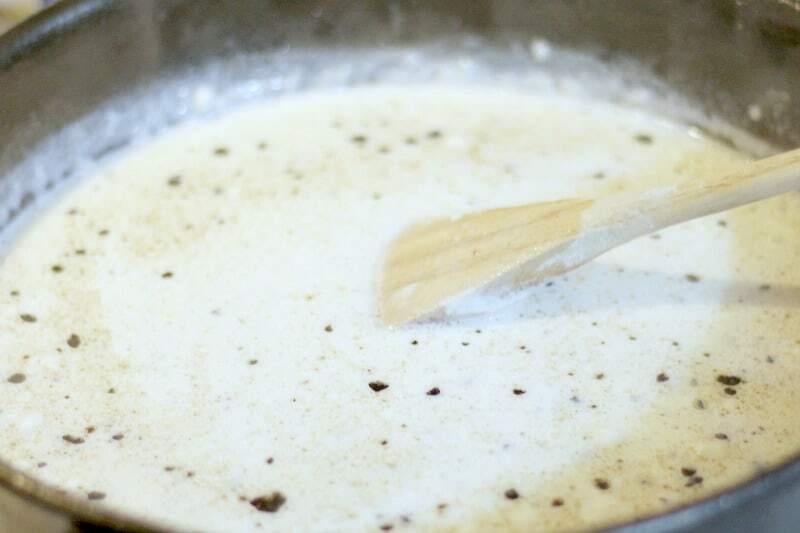 Why do we call it milk gravy? Because it’s white and made with milk, silly! My family makes this, traditionally, using cube steak. I didn’t have cube steak tonight when John asked for Chicken Fried Steak so I improvised. 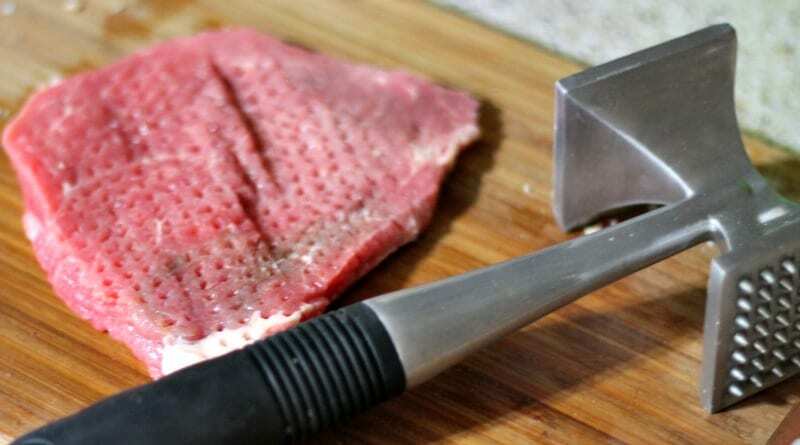 I did have eye of round steak and a tenderizer. I pounded out the meat until it looked like cube steak and then seasoned it with salt and pepper. Dipping the steaks into an egg/milk mixture then dredging in a flour & seasoning mixture was step 1. Next up I dipped the coated steak quickly in the egg/milk mixture again and dredged in bread crumbs. From there I fried 2 steaks at a time until done. The gravy is what brings it all together though. You just can’t have Country Fried Chicken without the milk gravy – there’s legalities and all. Maybe not, but it should be. I know a lot of people are intimidated by making gravy themselves; John still wont try it. But it is so super easy. I’m not just saying that because I can do it – I’m saying it because it’s true. The secret to gravy is in the drippings. When you’re done frying empty the grease and drippings into a large bowl. Strain the pieces of fried goodness from the drippings and add them back to the pan. Then take about 4 tablespoons of the fat and put it in the pan. Turn the heat up to medium, stir in 1½ cups of milk and bring to a boil. Add 2 – 3 tablespoons of flour and beat with a whisk until it’s mixed well with no flour lumps. Add another 1 – 2 tablespoons to reach the desired thickness. The gravy will thicken up as you go – if it gets too thick add a little more milk to thin it a bit. Keep stirring it until you’re satisfied. That’s how easy it is to make gravy – so stop using that canned or pouch crap! In a medium bowl mix 1 cup of milk with 1 large, beaten egg. In a large bowl combine flour with salt and pepper to taste. In another medium – medium large bowl combine breadcrumbs with salt and pepper to taste. Tenderize the steaks until as thin as possible. Dip the steaks, 1 at a time, in the milk egg mixture. Dredge the steaks through the flour mixture, making sure to evenly coat the steak. Quickly dip the steaks back in the egg mixture and coat with bread crumbs. Fry steaks, 1 or 2 at a time for 4 – 5 minutes per side. Remove the steaks to a paper towel lined plate and allow to drain. Strain fat from the pan for the gravy. Discard or save all except the large pieces and 4 tablespoons of the fat which you’ll transfer back to the pan. Sir in 1½ cups of milk and allow to come to a boil, stirring often. Add 2 – 3 tablespoons of flour and whisk until smooth (at least until there’s no large bits of flour.) Whisk in the remaining 1 – 2 tablespoons of flour until desired thickness is reached. Continue to stir until the gravy starts to thicken then transfer to your serving dish. Season with salt and pepper to taste. Slather the gravy on the Chicken Fried steak or use it sparingly – whichever you prefer. I’ve never ordered it at a restaurant! That and hamburger steak are 2 things I always want to order but never do. I love making something fried every once in awhile…I will have to try this out…it looks so good! I don’t get to eat much fried food, so the occasional indulgence like this is awesome lol. Chicken fried steak is so good! I had never had it before I met my husband but he loves it so I learned to make it. I’ve pinned your version to try the next time he’s craving it. Nice! I’d love to hear how he likes it. I haven’t ever made this myself but I love to eat it. And now that I know how to make it…well I expect we might be eating it more often. And I don’t really care how bad for us it is!! LOL. My grandma always put the flour in the grease and then put the milk in when the flour was just barely brown. Didn’t know you could do it the other way. This looks so good and is one of my favorite treat meals! I always wanted to know how to make this. I order this when we eat at Cracker Barrel. Thanks for posting!! Looks great! Definitely one of my guilty pleasures! I’m caregiver for my 85 year old father and he loves to eat. Going to make this today for him. Never had it but always wanted to try it. Seems very straight forward. Can’t wait for dinner. Thanks.